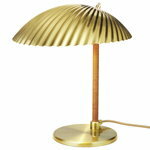 Paavo Tynell’s 5321 table lamp is also known as the Shell Lamp due to its brass shade resembling a seashell. Tynell found his inspiration for the 5321 lamp from the nature and Romantic era, and its simplified appearance also echoes influences from the mid-century modernism. Located right under the shell-shaped shade, the light bulb is like a bright, glowing pearl. The organic appearance of the brass surfaces is complemented by a rattan-covered stem. 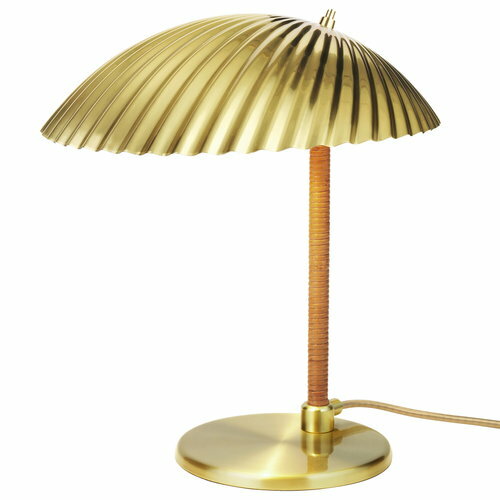 Originally released in 1941 by the Finnish Oy Taito Ab, the 5321 lamp is part of the Paavo Tynell collection that was launched in 2018 by the Danish design brand Gubi. 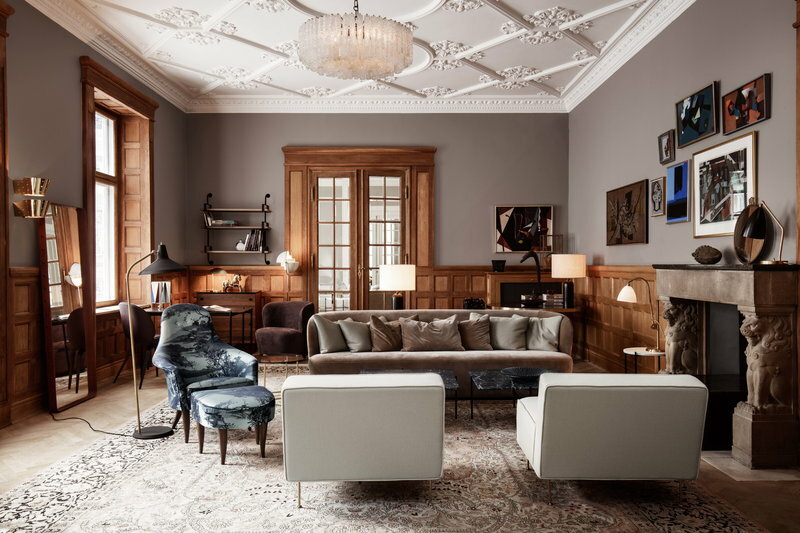 Paavo Tynell (1890-1973) is one of the best-known Finnish lighting designers, and his work has had a great influence on modern lighting design also internationally. Tynell started his career as a blacksmith and studied at the Helsinki University of Industrial Arts, where he continued as a teacher. In 1918, Tynell co-founded the metalwork and lighting company Oy Taito Ab, and worked as the company’s CEO and chief designer until 1953. In the 1930s and 1940s he designed lighting for various public spaces, such as Helsinki’s Parliament House and the office of the Secretary-General of the United Nations. Tynell’s designs merge together simple and decorative shapes as well as sculptural and natural elements. The lamps are often made of brass and decorated with perforated patterns. Tynell collaborated with notable Finnish architects including Alvar Aalto, and participated in the lighting design of Aalto’s buildings such as the Paimio Sanatorium, Helsinki’s Savoy Restaurant and Viipuri Library. He also gained success in America, where his customers included private homes, lighting manufacturers and New York’s Finland House. During his career Tynell was awarded at the 1929 Barcelona World Fair and 1933 Milan Triennale, and in 1951 he received the first prize at the Good Design Awards. Today, Tynell’s original designs are collector’s items that reach high prices in auctions. 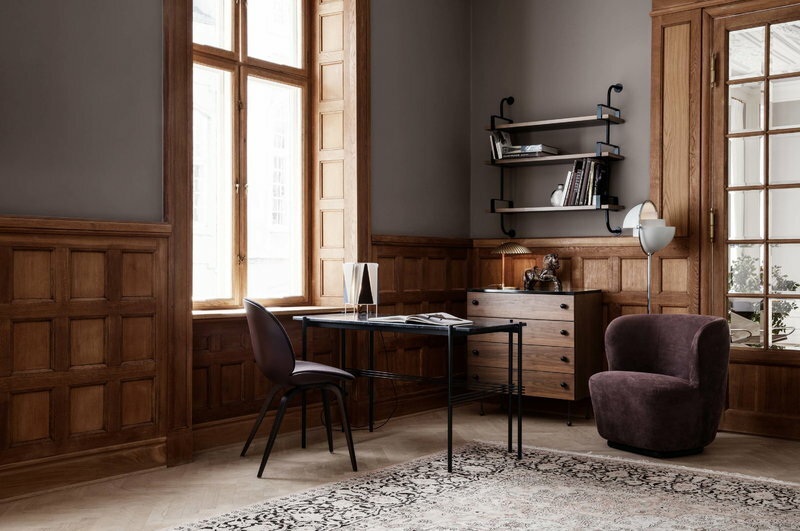 In 2018, the Danish design brand Gubi relaunched a long-awaited collection of Tynell’s designs.